My daughter is six years old. She came home from school one day and had some fruit snacks as she usually does. She played for a while then I looked and she had fallen asleep on her brother's bed (nothing new or different on the bed). When she woke up she put on her jams and then came upstairs and said she was itchy. I told her that after her bath I would put lotion on her because it was probably just dry skin. Within thirty minutes she was scratching all over and had red bumps all over her skin and they spread every time she touched her skin. I put her in the tub, washed her, put Calamine lotion on her, and gave her some Benadryl. She then stopped scratching and fell asleep. My daughter woke up about 2 hours later and felt better but she still had a few spots on her skin. Today she has red rash bumps - some small ones and some bigger ones. She hasn't complained about them itching, however. She has two in two different places that look like ringworm. They are a little red and a bigger spot almost in a perfect circle. I have been getting this red rash in the form of these tiny red bumps mainly on my forearms and hands and sometimes on my legs and chest too. They seem to be increasingly aggravated whenever I go into the ocean or I am outside on a hot day sweating. I have no clue what caused them because they randomly started to appear and I have looked up what it could possibly be but I never got the correct answer. Does anyone have any ideas as to what it might be? Moderator's note. 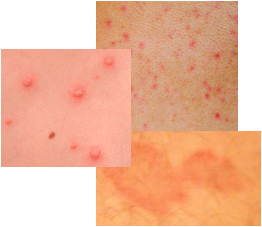 This could be a heat rash or sweat rash as discussed at this page. My red rash started out looking like burst blood vessels under the skin. It is very red, but not raised or itchy at all. It has now become raised, very red and very very itchy. It is not responding to over the counter anti-itch creams, including diaper rash creams. I had a red spotty rash for two weeks. Expecting the worst, I visited the doctor after having red spots appear on the back of my hands which began to spread and cover my body. The first doctor thought it was contact dermatitis and gave me some weak steroid cream, which I used for a week with almost no effect. So I returned after a week and saw a different doctor who actually suspected that it was viral but referred me to dermatology who treated me like an animal and diagnosed me with lichen planus. They gave me some stronger steroid cream. After that depressing and false visit, I go home, look up lichen planus and with my high school dipolma rediagnosed myself. My red rash was not at all like lichen planus, and then remembered that my sister had strep throat about two weeks before, which was right around the time I developed the rash. I figured one way or another I had contracted it but only on the skin and not exactly sure how, but after reading more I was confident in my diagnosis.